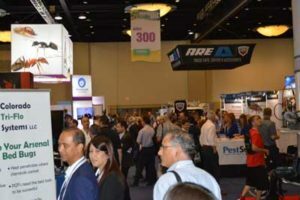 The National Pest Management Association (NPMA) says attendance at this year’s PestWorld 2018 event smashed previous records, as more than 4,000 convened in Orlando, Fla., Oct. 23-26. This was the highest attended annual conference for the NPMA. Since its inception in 1933, the organization has supported the pest control industry’s efforts to protect public health, food and property. Its staff addresses the technical, governmental, educational, business, and networking needs of its more than 5,500 members, who provide professional pest management services. The event featured an exhibit hall that showcased products and services geared to pest management professionals (PMPs), a lineup of educational sessions for which PMPs could earn recertification credits, keynote speakers, NPMA committee meetings as well as a reception showcasing NPMA’s committees and a party to mark PestWorld’s last day. Next year, PestWorld will take place at the San Diego Convention Center Oct. 15-18 in San Diego, Calif.